Excellent……!!! 2011 seems to be rocking for TGS viewers…. It would have been better if if you could have explained more on each topic. Probably each high level boot process would need a separate page. This doc is good for begineers. plz explain GRUB in detail…….How to use GRUB command prompt at system startup ?? These are very helpful. Keep ’em coming please! thanks alot, just in time to futher clarify things lol..As always, TGS rocks!!! I learn to much with your blog. Thank you. 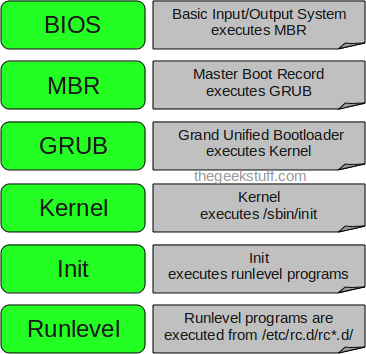 I know the terms GRUB, KERNEL,INIT, MBR. But i do not know how they work together. Thanks to Ramesh Natarajan, for his blog and useful posts. The file that most would want is. The menu.list that is in the /boot/grub/ directory on my debian system. I often edit this file for a manual kernel update,time out,boot image change. Really nice document for quick reference to Linux boot process!!! An excelent article, I see another great article here. Great article Ramesh! But is not completely valid for Ubuntu, which use upstart. Nothing on /etc/inittab, for eg. Love this site, your explanations are excellent, and I like how you define terms and acronyms. Sometimes a man page can make my head spin – your site is the antidote to that – thanks!! How many times did i ask myself how to find out order of linuxs’ start ? when this time i saw your blog via TSG, i see thoroughly. Awesome !! For beginners helped a lot..
great article! very useful! thanks a lot. really…….my total confuse remove after read this article.Thank you…………. Are you sure that “Depending on your default init level setting, the system will execute the programs from one of the following directories.” ? For example my system is running on level 3 but executes VERITAS init scripts from rc2.d during the boot as well. Enough detail and simple . I am flabbergasted.. I have made automation on these parts on S and K .,.. It was too Easy to understand this.. The person who post this.. is really a cool techie.. U rock man..
That was very useful information. Thanks dude, that was so helpful..
Great and brief doc for Linux boot process. I truly liked it!!! Superb article with detailed information. Very nice, very neatly explained. Good One, will be helpfull for new leaners!!! You can bypass the first three stage using kexec program for fast boot. This saves time when you have to reboot a lot for tuning system or handling init script. Debian provides it as kexec-tools package. vmlinuz is the kernel image file I uses. If the kernel image uses initrd file, add –initrd option. Without it kernel will panic next boot. Linux will boot up without going through BIOS, MBR, and Grub. Excellent and simple explanation and a great deal for beginners !! Thank you. what is 1st stage boot loader and what is 2nd stage boot loader ? kindly clear this point also. I am working on Linux since decade. Some times I am unable explain the basic stuff like this. Thanks for explaining Ramesh Natarajan. Today onwards, I am the member of your fan club. Description is good and very easy to understand, thanks for this. Anyways I am happy for this post. Excellent material. So simple to understand it. Doing a great job!!!!! its a superb article……….and simple and superb explanation. This is really nice article. Appreciate your excellent work. sir now i am using windows7 and linux in one computer.i dont want to use linux that have 250gb harddisk then how to boot(delete) a linux and how to plaace 250gb in windows7? Pls hlp me. Oh yes .. this is what i am seeking for .. something simple and effective ..
but you my friend .. u r brilliant .. this really easy and useful explanation ..
good explanation & easy to understand!!! Perfect article on Great topic. Thanks a ton for your efforts to provide such a excellent information by keeping it simple. Superb Article !!! Excellent explanation. I got confused by studying the process in another sites however this one is very easy to understand and remember. Thanks for such a nice explanation….. This article has cleared my all doubts. that is why lappy takes so much time for startup, actually this guy is busy in doing this or that, offcourse useful. Thanks a lot. very nice…. This is the best explanation i’ve seen so far. The role of initrd is not clear at all. When and how is it used? clear at all. We can change boot device (interactively or not), we can change the kernel (interactively or not), we can change the boot menu and give orders to grub….. can we change initrd? how? what for? and the init proces? inittab seems to be deprecated in Debian…..
“Programs starts with S are used during startup. S for startup. The S set are the programs that are started when we enter in that runlevel and K is the set of programs that are killed when we enter in that runlevel? Awesome Tutorial. Linux Boot Process Cleared Very Well. Nice and well explained, thank you so much. The information here all seems correct, however I think you do a disservice to the reader not to mention that this is just one of many different ways to load Linux on a PC architecture. Other architectures use other methods, and there are other methods available on a PC architecture, and the version and configuration of the Linux kernel itself affects the boot process. Thank you for a very clear presentation. I have one small comment, I went looking for the meaning of “MBR” and “initrd” before reading on to find you gave them later. May I suggest an expansion of the acronym in brackets immediately after the acronym. Thank you again very well done. Very well explained. But latest Ubuntu version 14.04 has some changes with respect to above explanation. very nice …… so helpful. But linux Os (like Cent Os 7) dosen’t have grub.conf. Sorry. I am beginner of Linux! MBR is a bootloader ? wow!i got too much information which was actually new for me. thank you sooo much. nice experience, nice information, thank you so much. great one. it has given a simple procedure and best among all..
Thankyou Ramesh. That was so simply explained 🙂 ! How to change the runlevel if it is set to 0 or 6. Really good article on Linux boot process. Hai It was awesome to read this. Thanks for your article. Easy to understand amazingly explained. its good Excellent explaination . A bit outdated though; would be good if you would keep the article updated.